AGORA Team is pleased to offer an online course for AGORA (Access to Global Online Research in Agriculture), one of the four programmes of Research4Life. Anyone working or studying in agricultural and related sciences can apply for the course. Priority is given to anyone from Research4Life eligible countries, Group A and Group B respectively. ONLINE REGISTRATION FORM is open until 8 October 2017, Sunday 23:00 CEST. 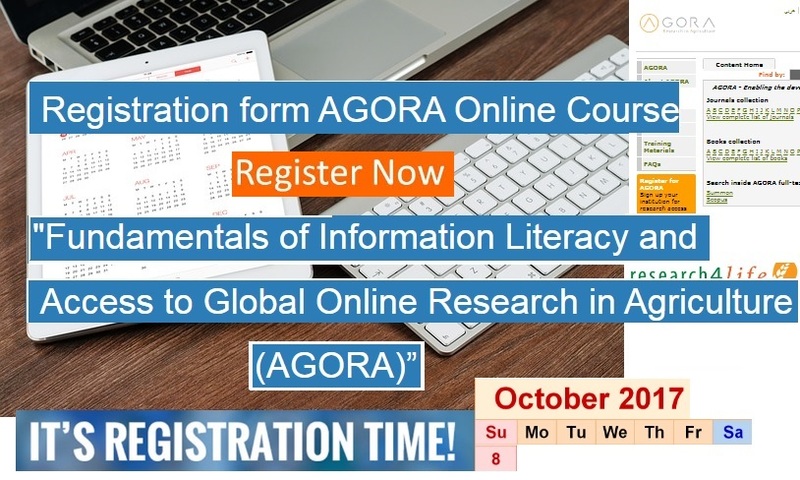 The course aims to provide information about the fundamentals of information literacy competencies and develop necessary skills to access and effectively use AGORA (Access to Global Online Research in Agriculture) which is a collection of up to 6,500 key journals and up to 22,000 books to more than 3,000 institutions in more than 115 countries. For more information and other details, please see the Course web page.